Place boiled or canned chick peas into a food processor or use a blender to form a puree. Then add the rest of the ingredients and mix them all. 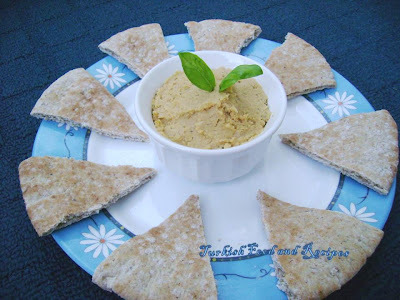 Serve Humus (chick pea dip) with warm pita bread or tortilla. P.S: You may always substitude tahini with olive oil, if you do not have tahini. Haslanmis ya da konserve nohutlari blendir ile pure haline getirin. Daha sonra diger malzemeleri ilave edin ve guzelce karistirin. Humusu sicak pide ya da lavas ile servis yapabilirsiniz. NOT: Tahin yerine zeytinyagi da kullanarak humus yapmayi deneyebilirsiniz. evet bu humusun tahinsiz versiyonu:) Her zaman tahin bulamayanlar icin ideal, tavsiye ederim.